You can make social media tools effective for your blog post. 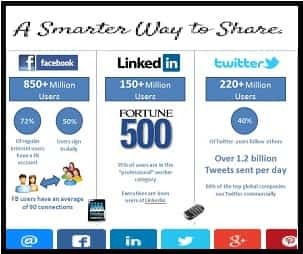 Content sharing is important for blog promotion and social media is the best platform to add people and serve post content effectively. Your content may be viral if the quality of content will be best for the visitors. The blog should provide a solution to the readers. This is another thing that reader visit your site through the search engine or social media. You should serve the best, unique and needful content from your side. Social media is the biggest platform for your blog post promotion. The best way to use this tactfully is defined here. How To Increase Likes On Social Media? Visitors always like quality content and messages. They share the content with friends and colleagues if they fill that the post is authentic and knowledge-based. To increase the likes and comment on the post, you will have to write good and interesting articles. Another tip to increase the presence of visitors on your social media dashboard is to add some decent post, so they visit again and again for a new one. It is not mandatory to add to every people. They will increase spamming. The number of Social Media platforms are available today. Google Plus, Facebook, Instagram, LinkedIn etc. To avoid spamming link, you have to add people with prior intimation. The best way to invite people through the mail on your social media group. Share your blog content with them. Get the feedback on your content from them to improve the blog content quality. The invitation mail or invitation through social media leave the good impression of the blog post and definitely, they will share with others. Once time you will start the implement this. You will get the number of shares, likes, and traffic on the blog by social media platform. This is the right approach and perfects to optimize your blog post. Which Tools Can Be Used To Flash Post On Social Media? The best way to use the tools, which are working to share the post automatically through your social media platform. The best two are Hootsuite or Buffer. You have to link this platform with your social media account and set the time to publish the post. You will be relaxed from the additional effort. Tracking facility will also be given by platform. Now ready to judge the performance on daily basis through analytic. What Title Should Be Used On Social Media? A compelling title is the best way to get a better result. Try to add the number to your content title before sharing the blog post. Your title should not be like this ‘How to increase monthly income’, that should be ‘How to Increase Monthly income by 80%’. These points are also important at the time of taking the decision of post title. The title should be increased the reader eagerness to read the content. The negative title also attracts readers. Social Media Sharing Buttons Placement. Social media sharing button placement is very important to register the visitors like an opinion on the post. This should be added to the last of the content, so visitors use to share the blog post instantly after completing his reading. Social media buttons already added to your media pages with the option to share the content in public, friends, and self too. Images play a vital role to increase the visitors on site. Every social media platform add your post image when you post the content through URL. So, make the image according to the post title with a clear message. You add the image title and alt tag and add keywords with alt image text. Add the caption with the description of an image. These help search engines to categories. Create Tweetable quotes in blog content to share on Tweeter. This is best to improve the presence on social media. Use “hashtags” (#) for extra exposure of post. Try to add the image to your tweeter content, that will improve visibility and engagement. These tips definitely help you to get a big number of likes and visitors on the blog post.